Norkey's is a new rotisserie chicken restaurant on Old Georgetown Rd in Bethesda. I had the Chicken Breast Sandwich. It is a pretty simple sandwich, chunks of rotisserie chicken on a baguette with lettuce and onions (and Mayo, but I didn't get that) My first impression was that it was larger than I expected. It was pretty tasty, chicken with a lightly charred taste that helped the flavor. The chicken chunks were a good size and moist. It was pretty reasonably priced for what you get too. The only negative was that the onions should have been separated better, I'd occassionally get a bite with too much onion in it. It also came with a small side of spicy mayonaise sauce. I tried it, but the spiciness overwhelmed the light flavor of the chicken. This was my first trip to Norkies chicken, but probably won't be my last. The location isn't the best, and it is more geared towards carry-out than eating there, so keep that in mind. They also deliver (limited area, minimum order, blah blah). Another note, the sides you can get with the rotisserie chicken are pretty much all starches, fries, rice, and potatoes, stuff like that. It is located 7812 Old Georgetown Rd, Bethesda, MD. They also have online ordering options, but I haven't tried that. 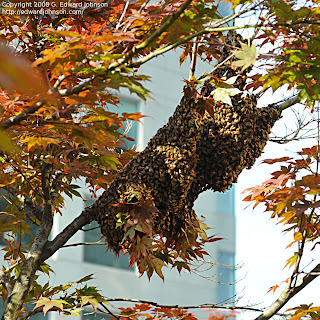 I was walking through the plaza over Bethesda metro station and saw a nice bee swarm on one of the maple trees. It is right on the plaza and they have yellow 'No Parking' tape blocking off the area so it is easy to find. these swarms only last a few days before they move on, so this is a rare chance to see a swarm in a very convenient place. Bees aren't as aggressive as they are swarming, so you can probably get fairly close without any problems, but if you are allergic, you might want to bring your epipen. I see perl as much like a leatherman tool, except, in addition to the usual complement of screwdrivers, pliers, and knives, it also has a lockpick set and a microscope. And a chainsaw, and an arc welder. And a limitless supply of duct tape. And just in case you don't know, perl is a programming language, though, if you don't know that, this post probably isn't relevant to you.